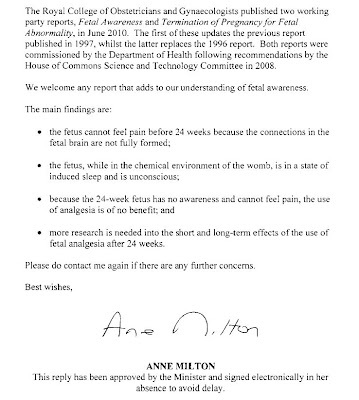 The inimitable Cranmer has drawn attention to a letter from Health Minister Ann Milton which uncritically parrots the findings of a recent RCOG report claiming that foetuses cannot feel pain before 24 weeks, are unconscious in the womb and do not require pain relief when undergoing surgical procedures. This is apparently the official line that the Department of Health now takes on this controversial issue and I suspect it partly explains the fact that prominent members of the Conservative front bench (Lansley, Osborne etc) do not support a lowering of the upper limit for abortion below 22 weeks. I have previously highlighted on this blog a recent editorial in a leading medical journal (Ward Platt M. Arch Dis Child Fetal Neonatal Ed (2011)) which has called the RCOG report ‘an emperor with no clothes’. 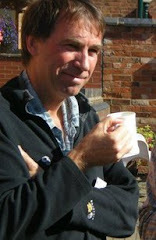 Martin Ward Platt, of the Newcastle Neonatal Service, who actually supports the current abortion law, argues that the RCOG report is a political rather than a scientific document which aims to shore up the pre-existing position of the RCOG rather than taking a dispassionate view of the scientific evidence. He argues, contrary to the RCOG, that over the last 20 or more years, researchers have accumulated good observational, experimental and pathophysiological reasons to consider that babies at gestations below 24 weeks do feel pain, that they benefit from analgesia, and that pain experiences in early life cast neurophysiological and behavioural shadows far down childhood (see my last report for more details). It is most disturbing that a health minister has taken such a strong position on an issue bearing strongly on public policy, which is at best highly contestable and at worst lacking any evidence base. I have previously argued that so few doctors are willing to perform abortions on babies above 20 weeks precisely because they are not willing to kill and then dismember what, for all intents and purposes, is quite obviously a baby. I have also previously highlighted the cases of Jacob McMahon and Charlie Allen, who both survived after being born at 23 weeks gestation. 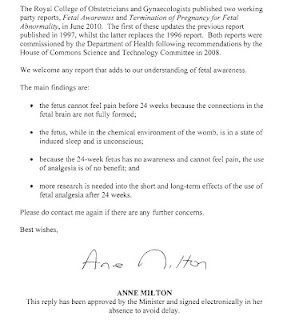 Ann Milton in her role as health minister should not be expressing such certainty about such important issues when the evidence does not justify it. That is seriously to mislead the public. Perhaps she has just been wrongly advised and is simply not aware that the view she is expounding has been very severely criticised in the medical literature. If so we should not question her integrity. 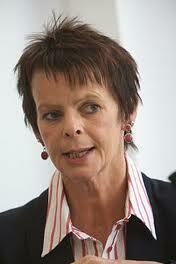 But even so, she does now have some very serious explaining to do. International right to life recently quoted a text book on neurology, “Functioning neurological structures necessary for pain sensation are in place as early as eight weeks, but certainly by thirteen and one-half weeks of gestation. Sensory nerves including nociceptors reach the skin of the fetus before the eighth week of gestation. The first detectable brain activity occurs in the thalamus between the eighth and tenth weeks. The movement of electrical impulses through the neuro fibers and spinal column takes place between eight and nine weeks gestation. By thirteen and one-half weeks the entire sensory nervous system functions as a whole in all parts of the body.” Yes, a fetal baby can feel pain. Apollo Hospital Doctors-This website reflects my work as a senior consultant as neurosurgeon and clinical co-ordinator of the department of neurosurgery and spine surgery at the Indraprastha Apollo Hospitals, New Delhi and as an Honorary Director of Indian Head Injury Foundation (IHIF)." Yoga Teacher Training Rishikesh-200 hour yoga teacher training programs & yoga instructor courses certified by Yoga Alliance (RYT 200) at registered yoga school (RYS 200)."